White House Changing Story on Anwar al-Awlaki? A Debate on NYT’s Inside Account of ’11 Drone Strike | Democracy Now! National Security & Human Rights director at the Government Accountability Project. She is former ethics adviser to the United States Department of Justice. Read Jesselyn Radack's response to Scott Shane: "Me on Democracy Now! : NYT Is Govt Mouthpiece on Droning al-Awlaki"
AMY GOODMAN: We’re looking at the killing of Anwar al-Awlaki, and his son two weeks later. This was in September of 2011, Anwar Awlaki’s targeted killing by a U.S. drone in Yemen, and his son, Abdulrahman. Both were born in the United States. His son, 16 years old, was born in Denver. Anwar al-Awlaki’s father, Nasser al-Awlaki, spoke recently about the U.S. killing of his 16-year-old grandson by this drone strike in Yemen, October 14th, 2011. The attack came as the Denver-born teenager, Abdulrahman, was eating dinner at an outdoor restaurant with his teenage cousin. He was killed just weeks after his father was assassinated. NASSER AL-AWLAKI: I want Americans to know about my grandson, that he was very nice boy. He was very caring boy for his family, for his mother, for his brothers. He was born in August 1995 in the state of Colorado, city of Denver. He was raised in America, when he was a child until he was seven years old. And I never thought that one day this boy, this nice boy, will be killed by his own government. AMY GOODMAN: That was a video prepared by the ACLU of the grandfather of Anwar—of Abdulrahman and the father of Anwar al-Awlaki. His name is Nasser al-Awlaki. Scott Shane, the American Civil Liberties Union and the Center for Constitutional Rights issued a statement in response to your article. The statement read in part, quote, “In anonymous assertions to The New York Times, current and former Obama administration officials seek to justify the killings of three U.S. citizens even as the administration fights hard to prevent any transparency or accountability for those killings in court. This is the latest in a series of one-sided, selective disclosures that prevent meaningful public debate and legal or even political accountability for the government’s killing program, including its use against citizens. Government officials have made serious allegations against Anwar al-Aulaqi, but allegations are not evidence, and the whole point of the Constitution’s due process clause is that a court must distinguish between the two. If the government has evidence that al-Aulaqi posed an imminent threat at the time it killed him, it should present that evidence to a court,” unquote. Scott Shane, you’re the co-author of this front-page Sunday Times piece, “A U.S. Citizen … in America’s Cross Hairs.” Can you respond? SCOTT SHANE: Sure. Well, I mean, I should say that we at The New York Times, we’re reporters: We’re all for transparency. And one thing that that statement from the ACLU and the Center for Constitutional Rights failed to mention was that The New York Times also has sued the government to try to get the legal opinions justifying Anwar al-Awlaki’s death, but also all the targeting, all the legal opinions on targeted killings. We’ve lost at the district court level, and that case is now on appeal, but we would like obviously much greater transparency. And part of the reason we do a lot of reporting and put a long story in the paper like that is to shed as much light as we can on the circumstances of his death. I think—you know, I mean, people can certainly read the ACLU press release and draw their own conclusion, but, you know, in essence, our article was saying that while there was a lengthy process of sort of legal study and debate inside the administration before they decided or justified the killing of Anwar al-Awlaki, they had in fact decided they couldn’t kill, could not target—that is, Samir Khan, because he was a propagandist and not an actual plotter. But he was killed anyway. And some people in the administration, I think, you know, found that that sort of cast a shadow on the long legal discussion about who you could kill and who you couldn’t kill, because they had killed both of them. And I think, you know, I can say that I—that, in general, across the government, the death of the 16-year-old, who, again, was not, as far as anyone knows, associated with terrorism, is seen as a disastrous mistake. And certainly the article pointed that out. So, you know, I think that press release is a little, perhaps, imaginative in suggesting that the story was defending the administration. In actual fact, the White House wouldn’t talk to us either on or off the record, and we got the information that we could, you know, where we could get it. You know, as the story says, it raises questions about the claims of the administration that this targeted killing program has been precise and very careful in who it targets and who it kills. AMY GOODMAN: Jesselyn Radack, I want to bring you into the conversation, National Security & Human Rights director at the Government Accountability Project, former ethics adviser to the U.S. Department of Justice under President Bush. Your response to the article and the justifications by the Obama administration for the targeted killings? JESSELYN RADACK: My response to the article was that it was very much like the June article The New York Times did about the kill list. And The New York Times, here again, gives a platform to the government to justify why it killed three U.S. citizens without charge, counsel or judicial review. And while Scott just talked about how the article is committed to transparency and neutrality, the article actually picks up a storyline only recently floated by the government, that Awlaki was operational rather than a mere propagandist. That storyline, that narrative from the government, only came out after the white paper was released. Yet, The New York Times works hard to make the case that he had somehow evolved from being a propagandist to being operational. And that’s important because the operational factor is what makes him eligible for a drone strike. Unfortunately, the other thing that makes him eligible is being an imminent threat, which The New York Times did not seem to go into detail about. So I feel like The New York Times has been carrying the government’s water in picking up its argument and, again, trying to make the case ex post facto that it was OK to kill Awlaki because he was somehow operational, even though Brennan, in Brennan’s own speech, said that to be eligible for droning you would have to be a senior operational leader of al-Qaeda, that you would have to bring a specific skill, and that it would have to be based on evidence, not mere allegations. SCOTT SHANE: Well, actually, it’s not the case that the information that Anwar al-Awlaki had become so-called operational, an operational terrorist, came out only in recent months, after the—in recent weeks, after the white paper was leaked. We reported that, along with most of the rest of the news media back in early 2010, when he was in fact put on the kill list, we were told. And that was because of the eyewitness testimony of Abdulmutallab, Umar Farouk Abdulmutallab, the Nigerian who tried to blow up the plane over Detroit. You know, the case that Anwar al-Awlaki was in favor of killing large numbers of American civilians, you know, I have to say, was pretty strong. He said it himself many times in speeches and lectures and messages on the Internet. You know, he didn’t hide his approval for the Fort Hood shootings. He actually spoke of his helping train Abdulmutallab to attack the airliner. So it wasn’t—you know, his intentions were not mysterious or hidden behind the classification that has, you know, sort of obscured a lot of this. You can certainly argue that he should have been captured rather than killed, that he should have been indicted in this country and should have, you know, served up criminal charges and then talked to the Yemeni authorities about trying to take him into custody. That’s certainly a legitimate debate and one that undoubtedly will go on for a long time. JESSELYN RADACK: Well, I actually have a number of blogs out there quoting The New York Times from 2010 saying that he was merely a cleric. And in terms of Scott’s argument, I have no doubt that he wanted to kill Americans, but so do a lot of people both in America and outside the country. There are tons of people who say very repugnant things about our country, and they have a First Amendment right to do so. And serving as an inspiration for people committing a crime is very different than actually being involved. And as far as we know, the Fort Hood shooter and the New York Times Square bomber both, according to The New York Times, only looked to him for inspiration. And in terms of actually getting help, the underwear bomber—again, we only have allegations that cannot be tested in court because, of course, the target is dead. 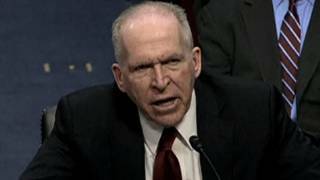 AMY GOODMAN: Last Wednesday, Republican Senator Rand Paul held up Senate proceedings for more than 12 hours with an attempt to filibuster the confirmation of CIA nominee John Brennan. One of the issues he raised was the U.S. killing of Anwar al-Awlaki and the killing of his son. Again, it was a fascinating day, Wednesday, to have the tea party senator, with his Republican allies, standing up and quoting all different progressive groups, making the argument that the Awlakis should not have been killed. This is Senator Rand Paul. SEN. RAND PAUL: Overseas, one of the most famous American citizens they killed was Awlaki. Before he was killed, he was primarily killed as someone who they said was a sympathizer. I think there’s no question he was a sympathizer. He, I think, denounced his citizenship. He was a bad guy. He sympathized with our enemies. And I think he could have been tried for treason. I think if I were on the jury, from what I’ve read of the non-classified information, I would have voted for his guilt and for his death. But the thing is, some kind of process might be helpful. His son, though, 16 years old, was killed two weeks later in a separate drone strike, and he was on nobody’s list, that I know of. They won’t respond. But I think the response by the president’s spokesman is reprehensible. It really should be called out. I mean, it’s sort of this flippant response that I think shows absolutely no regard for individual rights or for Americans. He said, well, the kid should have chosen a more responsible father. Think about that. Is that the standard that you wish your government to operate on in America? We’ve got a lot of criminals in our country. We’ve got a lot of bad people. If you happen to be the son of a bad person, is that enough to kill you? AMY GOODMAN: The filibuster of Kentucky Republican Senator Rand Paul. After his filibuster, he received a letter from Attorney General Eric Holder clarifying the administration’s stance. Holder wrote, quote, “Does the president have the authority to use a weaponized drone to kill an American not engaged in combat on American soil? The answer to that question is no,” unquote. That was Eric Holder. Jesselyn Radack, your response to Senator Rand Paul? JESSELYN RADACK: Well, I rarely find myself agreeing with Rand Paul, but in this case I absolutely do. And unfortunately, Holder’s response that someone has to be engaged in combat is really not as straightforward as it seems, because over the last decade the United States has interpreted “engaged in combat” to mean not only on the battlefield actually fighting, but contributing, donating money, donating resources to, even communicating with terrorist groups. So, engaged in combat, most people would take away to be actively fighting, when really there’s been a much more expansive and broad interpretation of that. And again, you know, I think being a propagandist and buying into the fact that Awlaki said a lot of horrible, abhorrent things about wanting to kill America is not enough to go ahead and give yourself the authority to be prosecutor, judge, jury and executor of anyone on the planet. AMY GOODMAN: I wanted to ask you, Scott Shane, about the filibuster of Rand Paul and the issues he raised. Now, that was raising the killing of American citizens in Yemen. The main thrust of his 13 hours wasn’t about killing people abroad, but killing American citizens on U.S. soil. But what about the issues that he raised, as well as his colleagues? The Democrat among them was Senator Ron Wyden, who has been raising these issues for quite some time. SCOTT SHANE: Well, partly, I think what happened there was that this program of targeted killings began in 2002 in secrecy. It greatly escalated in 2008 at the end of President Bush’s second term, and of course was expanded by President Obama into Yemen, into Somalia. But it has never had a serious public debate in Congress, because the administrations, both of them, took the position that this was secret, this was classified and couldn’t be discussed. So you have this—that was sort of just overcome with the Brennan nomination to head the CIA. And so, you kind of had the first serious public discussion in Congress of the drones and the targeted killings with the Brennan confirmation hearing in February. And then, what Senator Paul did with his filibuster was sort of expand on that. You know, it was, I think, telling that the first big debate was not by, say, the ranking member and chairman of the Committees on Armed Services and the Committee on Intelligence, but was in this filibuster by, you know, a junior Republican senator supported by the tea party. But it definitely had resonance and, you know, as you pointed out, got some significant support from folks on the opposite side of the political spectrum from where Rand Paul usually is. The left peace group CODEPINK delivered flowers and chocolates to him, to his office the next day, we reported. You know, what’s perhaps in the background of this discussion is that some people believe there should be a court, or perhaps the existing Foreign Intelligence Surveillance Court could be expanded, to cover targeted killings so that, at the very least, if the government was going to kill somebody, kill an American in particular, that the government would have to, at least in secret, present its case to address the questions that Jesselyn Radack raises. You know, what’s your evidence that this guy is an operational terrorist as opposed to a propagandist? At this point, there is no specific legislation to create such a court, but that’s been widely discussed in last few weeks. JESSELYN RADACK: I think that would be a horrible idea. The Foreign Intelligence Surveillance Court is pretty much a rubber stamp. I believe that it has rejected one application, which, by the way, is presented only by the government. It hears only one side of the story, and finally, yet again, operates in a complete secrecy. I don’t think we need a separate court system for this. I think we have perfectly legitimate, functioning Article III courts where people like this should be tried. Part of the danger that came out in the New York Times article is that the justification for killing Awlaki was that he was linked in various ways to bad—to bad people. And that’s essentially guilt by association. So, the fact that Awlaki was linked to bad people, or that his son was linked to his father by virtue of having him as a parent, those are really chilling rationales. AMY GOODMAN: You worked under President Bush. Your assessment of President Obama when it comes to these issues? JESSELYN RADACK: I think Obama has taken the secrecy regime put in place by President Bush and expanded it beyond the imagination of what many progressives could have ever thought in their wildest nightmares. AMY GOODMAN: Final comment, Scott Shane, and then Jesselyn Radack, as we wrap up, where this goes from here, where these white papers are, what actually is in the public record, and what you think needs to be in the public record? What is The New York Times pushing for right now in terms of transparency? SCOTT SHANE: Well, I mean, what we had done is, as an organization, was file suit under the Freedom of Information Act to get these legal opinions that justify targeted killings, not just of Americans, but of foreign suspected terrorists, as well. That case—we’ve lost that case on the first round, but that’s on appeal. I guess I should say that President Obama has pledged, first in his State of the Union address, and then subsequently it was mentioned by the attorney general, Eric Holder, the other day, some kind of greater transparency on this business of targeted killings. What that amounts to, whether he’s going to give a speech or what’s going to—whether he’s going to propose legislation, or what that will amount to, remains to be seen. JESSELYN RADACK: I think it’s long overdue that those memos be released. They were handed over to Congress, but then to the Senate Select Committee on Intelligence, which is still holding them secret. Meanwhile, that committee won’t release its 6,500-page report on the torture program. So we really have no publicly available information. And the government, instead of releasing this information to all of Congress, and instead of fighting this in court and allowing these cases to go forward, the administration has not even acknowledged that anybody was killed. It instead chooses to give authorized, selective, one-sided leaks to The New York Times, which is not sufficient for a public debate. AMY GOODMAN: I want to thank you both for being with us, Jesselyn Radack and Scott Shane. Jesselyn Radack is National Security & Human Rights director of the Government Accountability Project, former ethics adviser to the U.S. Department of Justice. Scott Shane is the co-author of the front-page piece in The New York Times yesterday about the killing of Anwar al-Awlaki called “A U.S. Citizen in America’s Cross Hairs: How the Government Came to Kill Awlaki Without a Trial.” We’ll link to that article at democracynow.org. This is Democracy Now! When we come back, it’s been two years today since the tsunami that led to the meltdown at the Fukushima nuclear plant. We’ll go to Japan to find out the latest. Stay with us.